Product prices and availability are accurate as of 2019-04-09 03:32:13 EDT and are subject to change. Any price and availability information displayed on http://www.amazon.com/ at the time of purchase will apply to the purchase of this product. 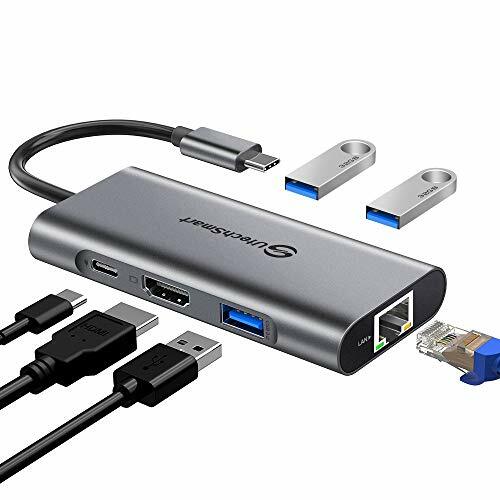 Six in one get 3 standard USB 3.0 ports, 1 HDMI multimedia port, 1 PD 3.0 USB C charging port and 1 Ethernet port for Internet connectivity in one hub. Use the same heat dissipation technology as MacBook Pro to extend the working life and provide a excellent performance. Buit in advanced dual-core VL817 chip with lower power consumption, quicker heat dissipation and higher data transfer efficiency than others. RJ45 LAN Port can support more stable Internet connection in speed up to maximum 1000M. Data transmission at a speed up to 5Gbps. Support USB flash drive, external hard drive, keyboard, mouse, printer, MP3 player etc. Support a large screen liquid crystal TV or display compatible with 4K Max output. Give you vivi 3D effect video sync. HP Elitebook 840 G3, HP ProBook 450 G1, iPad Pro, Asus ROG Strix Scar Edition GL703. 1.For a stable connection, connected devices should not exceed a combined current of 900mA. Not intended for use with high-power devices (external hard drives, iPads, etc.). 2.2.4 GHz wireless devices, MIDI devices and some USB 3.0 devices may not be supported. 4. Power is shared between all dock-connected USB C devices. If you would like to enjoy the fast charge, please choose over 72W Adapter to charge it. 5. Our USB C Hub don't support Nintendo Switch to get the LAN wired connection work for the chip compatibility. We are working on this issue. 6. The USB ports don't support data transfer With the iPad Pro for the chip compatibility. ?UtechSmart Dual-Core Technology OFFER 1 Year warranty? Offer 1 Year Refund/Replacement Warranty and Friendly Customer Service. Built in advanced dual-core VL817 chip with lower power consumption, quicker heat dissipation and higher data transfer efficiency. 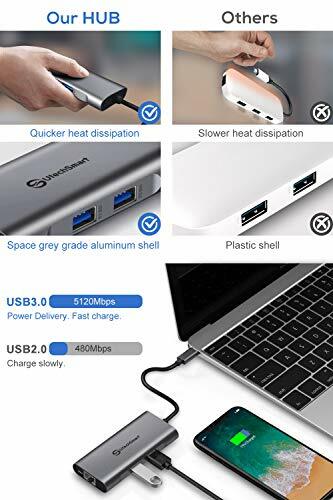 ?Temperature Control?Use the same heat dissipation technology as MacBook Pro to extend the working life and provide a excellent performance. Make it safe and reliable when 6 ports are occupied. 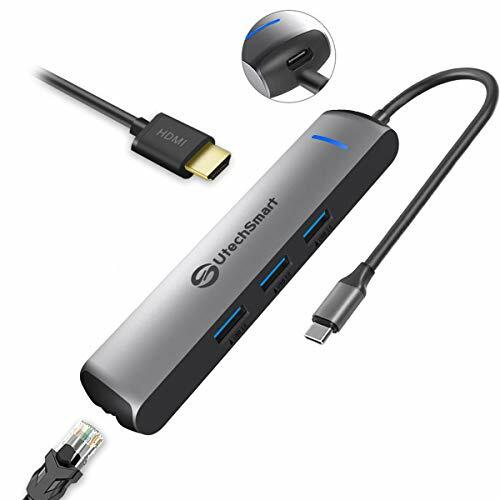 ?All-in-One USB C Hub? 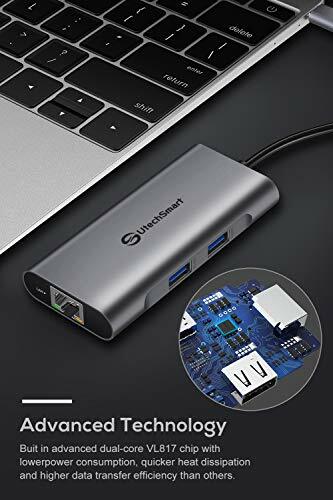 Connect to the latest MacBook Pro or USB-C devices with the 6-in-1 USB-C hub featuring an Ethernet port, a usb c charging port with Power Delivery, a 4K HDMI port, and 3 USB 3.0 ports. Data transmission at a speed up to 5Gbps. 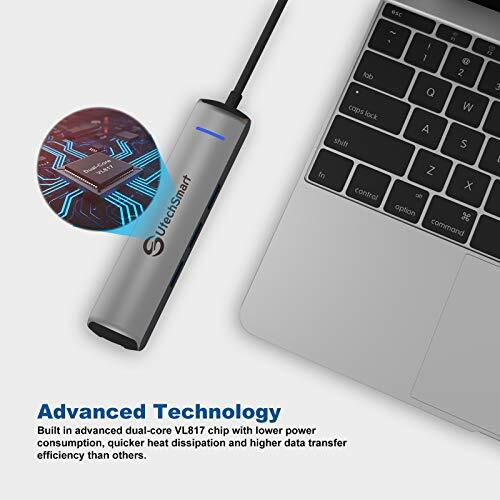 ?Power Delivery?USB Type C Hub charges your MacBook Pro or other Type-C devices while connecting 60W Power Delivery port. Now more and more devices and the newest mac pro support PD. With Power Delivery, a single USB-C port can give you blazing-fast charging speed experience. Perfectly match the mac pro. ?RJ45 1000M Ethernet Port & 4K HDMI Video?Supports 1000Mbps Gigabit RJ45 Ethernet Port, backwards compatible with 100Mbps/10Mbps RJ45 LAN. HDMI Port support a large screen liquid crystal TV or display compatible with 4K max output. Give you vivi 3D effect video sync. ?Stylish Design, Premium Build? Thin and Sleek Precision milled aircraft grade aluminum enclosure makes it a perfect complement for your Pro look and feel in NEW Space Gray. ?Board Compatibilty? 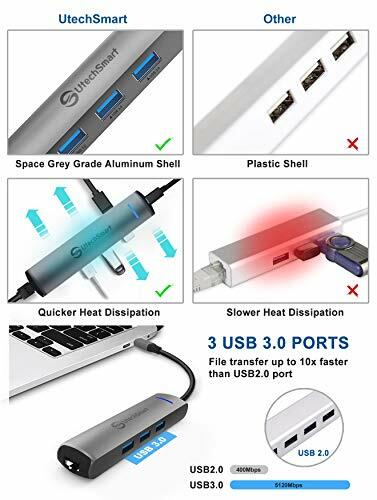 An ideal USB-C expansion hub for Apple MacBook, Apple MacBook Pro 2016/2017/2018, Apple iMac/ iMac Pro (21.5 inch, 27 inch), Google ChromeBook Pixel, Samsung, Dell, Asus, HP, Lenovo, XPS and many other Type C laptops.